#DisruptMining Continues to Accelerate the Pace of Change in Mining | Mining Association of Manitoba Inc.
Vancouver, September 10, 2018/CNW/ - GOLDCORP INC. (TSX:G, NYSE:GG) ("Goldcorp") is pleased to announce the third annual #DisruptMining innovation challenge and live finale event will be presented on Sunday, March 3, 2019 during the annual Prospectors and Developers Association of Canada (PDAC) conference in Toronto, Canada. Now in its third year as a catalyst for change in mining, the #DisruptMining innovation challenge has a track record of encouraging new ideas, identifying new opportunities and helping to accelerate the growth of new companies tackling challenges in mining in new and different ways. Innovators and entrepreneurs are encouraged to submit their ideas for a chance to pitch in front of a live audience of over 500 industry leaders and a "shark-tank" style panel of cross-industry titans. The winner(s) will have the opportunity to negotiate up to $1 million investment* for a proof of concept at one of Goldcorp's mines or direct investment in the winning technologies. "The mining industry today is collaborating and investing in technology and innovation like never before. We have digitized, automated and applied new technologies to various aspects of the mining life cycle, but our industry needs to accelerate the cycle of innovation even more to stay competitive, deliver greater value to shareholders and be best prepared for our future," said Todd White, Executive Vice President and Chief Operating Officer at Goldcorp. "Goldcorp is amongst the most innovative companies in the gold business, and we see #DisruptMining as a catalyst that helps us identify and champion new ideas, new partnerships, new technologies and new thinkers. At least seven of our #DisruptMining alumni have launched to new levels. We believe there are a lot more great ideas out there, and we're ready to help make them happen." Following the 2018 #DisruptMining challenge, winner Acoustic Zoom, an advanced geophysics company specializing in innovative seismic solutions, secured a $1 million investment in its business from Goldcorp and launched a $150,000 pilot program at Goldcorp's Red Lake Gold Mines in Ontario. Other #DisruptMining alumni including: Enviroleach, LlamaZoo, Open Mineral, Bio-Mine, Cementation, Goldspot Discoveries, KORE Geosystems and Tradewind Markets have transformed their rogue ideas, become established start-ups, substantially evolved their services and operations, or have scaled their leading-edge technology solutions. "DisruptMining was truly a catalyst for our business and put us on the world stage," said Prof. Jacques Guigné, Chief Executive Officer, Acoustic Zoom. "We now have multiple international contracts with major mining companies and have accelerated the development of our technology with further innovations, in addition to building our ability to service with a growing equipment portfolio." 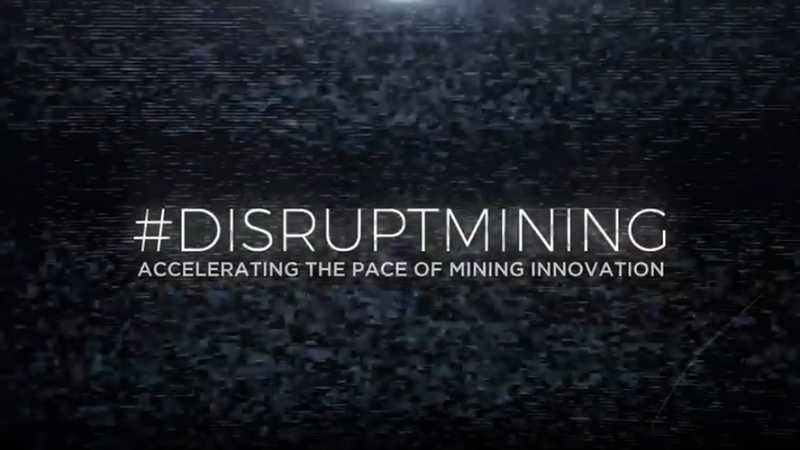 #DisruptMining offers entrepreneurs a platform to bring disruptive and exponential technologies to the sector, whether it's unlocking exploration opportunities; finding operational and production efficiencies; reducing the environmental footprint and delivering on sustainability commitments; or developing alternative ways to finance capital projects. Any innovator interested in pitching their idea at the #DisruptMining innovation expo and "shark-tank" style live event is encouraged to submit an application. Full application details and requirements can be found at: www.disruptmining.com. Submissions will be accepted until November 5, 2018 at 11:59 pm EST. Late submissions will not be accepted. Mining Transformation: Operate and manage mines with increased productivity. Metallurgy Transformation: Decrease the mass, energy, water and chemical intensity required in metallurgical processes. Sustainability Transformation: Move Towards Zero Water and sustainable energy usage. Digital Transformation: Create digital intelligence with new applications and integrated interfaces. Geology Transformation: Improve mineral mapping and measurement. "Go Rogue": An idea so out-of-the-box it deserves its own category. Finalists will pitch their competing innovations to a "shark-tank" style panel of cross-industry titans and the winner will have the opportunity to negotiate up to $1 million* in investment for a proof of concept at one of Goldcorp's mines or direct investment in the winning technologies. More than 500 mining executives, investors and financiers will be in attendance, each looking for that one revolutionary idea that will get them to the future of mining, faster. Are you committed to championing innovation in the mining industry? 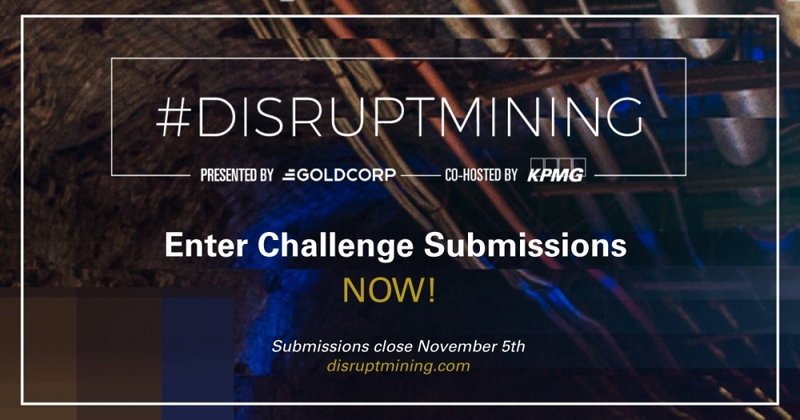 Would you like to be showcased at the #DisruptMining Challenge, one of Canada's largest gatherings for mining innovation? To learn how to become a sponsor of this trailblazing challenge and event, please e-mail disruptmining@goldcorp.com or connect on social media via #DisruptMining. Proceeds from the #DisruptMining finale event will invest in the future of the mining industry through innovation-focused scholarships. Certain disclosures in this document constitute forward-looking statements, including the timing and completion of the #DisruptMining expo and live finale. In making the forward-looking statements, the Company has applied certain factors and assumptions that are based on the Company's current beliefs as well as assumptions made by and information currently available to the Company, including that the Company is able to execute the challenge in accordance with the terms described herein. Although the Company considers these assumptions to be reasonable based on information currently available to it, they may prove to be incorrect, and the forward-looking statements are subject to numerous risks, uncertainties and other factors that may cause future results to differ materially from those expressed or implied in such forward-looking statements. Such risk factors include, among others, those matters identified in its continuous disclosure filings, including its most recently filed annual information form. Readers are cautioned not to place undue reliance on forward-looking statements. The Company does not intend, and expressly disclaims any intention or obligation to, update or revise any forward-looking statements whether as a result of new information, future events or otherwise, except as required by applicable law. * CAD $1 million investment not guaranteed, and/or investment may be allocated among multiple finalists; exact level of investment, if any, is at Goldcorp's sole discretion and subject to completion of appropriate due diligence.